Indie natural brand Strange Invisible Perfumes has launched Virgo and Pisces, the first two in a series of limited edition unisex fragrances based on the zodiac signs. Virgo ~ "Seamless layers of rare ingredients and unexpected synergies speak to the quintessential Virgo soul. Eccentric notes of baked earth, sandalwood and palo santo add depth and introspection to clean, sparkling notes of neroli, temple mandarin, and rose, creating a precise, yet soothing composition that will satisfy even the most ruthless perfectionists." Additional notes include jasmine. Pisces ~ "Fluid and aquatic, Pisces Eau de Parfum is a tribute to the twelfth sign of the zodiac. Given Pisces' dreamy and sometimes impractical nature, notes of frankincense, cedarwood and black pepper ground the imagination while jasmine, kewda and lime keep the waters of creativity abundantly flowing." Additional notes include angelica, ylang ylang, bay leaf and black pepper. 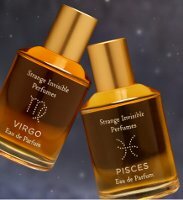 Strange Invisible Perfumes Virgo and Pisces are $275 each for 50 ml Eau de Parfum. I’m not feeling the black pepper or lime for a Pisces. I’m with you on that. I’m not seeing how frankincense and cedar are all that fluid and aquatic either. They sound nice. A bit too pricey for my budget though. Agree with you both 100%. I am an astrology enthusiast and I can tell you that black pepper, lime and whatever else they have in there would not make me think of Pieces. A fire sign, maybe, for the pepper at least. Sometimes I think people do this stuff because it’s the hip thing now. ‘Strology’s a lot more complicated than that. But perfume and sun signs, that’s right up my alley. I am curious as to what they’ll include for Aries. Did I ever tell you folks about my habit of buying perfumes “created” by Aries celebrities? (all women, of course). I wonder if people would think that’s too silly, but it’s just something fun that I like to do. So far I have six. Um, at the risk of sounding like a cannibal or a heretic, I like lime juice and pepper on fish. so maybe…. also, which are the aries celebrity perfumes? Point. However, I wouldn’t want to walk around smelling as if I was ready to be thrown into a frying pan, IMHO. 6) And, of course, Fergie, as Outspoken, aka Amerige DeGivenchy in disguise. But I only have one of each. These ladies come out with new stuff all the time, I couldn’t and do not wish to keep up. I don’t think the notes are supposed to be so literal. It says the pepper is supposed to reflect the imaginative aspect of Pisces, which is supposed to be a highly mutable sign. I have literally no thoughts whatsoever on what notes would fit what sign — it isn’t something I pay much attention to. But I do love those bottles! Now about those prices….. that brings me right back to earth! Thank you! Rushing about today & so didn’t even stop to wonder. Being the virgo girl that I am, I really must get my hands on a sample of Virgo because naturally I’m curious! We’re supposed to be down to earth perfectionists, hence the “earthy” and “clean” notes. Not sure if that sounds like my cup of tea…..and dear God, the price for a bottle is a little exorbitant, no? I’m with you on the perfectionism; and I am a Virgo; and I like the sound of this. But luckily I’m enough of a skeptic to find horoscope-stuff a bit annoying. Lucky cos this ones out of my price range! It is an expensive brand — it is all natural, plus she does much (? or at least some?) of her own extraction so she’s even creating her own raw materials. I’m a Pisces with a Virgo rising! I feel like this ad is speaking directly to me, but at 275.00 a bottle, yikes! I might just have to bury myself in my horoscope books instead. I don’t want to know that I might love these. I know what you mean — perhaps better not to know. I’m totally obsessed with Virgos (which Tama can vouch for) so I kind of want to pay $275 for it despite not particularly liking the sound of the notes. I’m a Scorpio too, or at least, I used to be — didn’t they change everything recently? I don’t think that was universally agreed upon by astrologers and I think there are different methods. Ophiuchus wasn’t new, but the mainstream astrology didn’t use it. I think. All of the Virgos I know (in real life and also a few of my favorite pop culture figures) are like 99% Virgo and Scorpio/Capricorn describes my personality perfectly whether its due to the stars or not!!!! I think that thirteenth sign was just some astrologer’s way of getting his/her fifteen minutes of fame. I mean, whether people believe in it or not, you can’t just take something that has been established for 2000-something years and change it in a week. That’s just silly. Much like that astrologer.If you were born a Scorp, Robin, then you’re still a Scorp. Most astrologers agree that the signs are sectioned off seasonally, not by what’s in the actual zodiac belt that’s circling over our heads. Thanks both! I don’t pay attention to horoscopes but I like being a Scorpio. Another a Scorpio here, though my moon, Mercury, Venus and Mars are all in Sag. I got the Nikki St Phalle Eau Defendue in each one to satisfy what inkling of astrology related perfume fix I had. Luckily, I really like the juice! You have those? Someone here said that those bottles all contain the same juice, it’s just that there’s different signs on the bottles. Is this true?!?!? I. Must. Know. Yes, just the bottles are different. Great fragrance! Virgo here and love the sound of my scent, but the cost at that cost I’d rather plop down $300 for Carnal Flower. I’d be annoyed if I didn’t like my own sign’s frag (Sagittarius)! And I’d feel weird buying Virgo since I’m so not Virgo-ish. Silly, really. Not that it matters, cause … $275! what happens if you are on the cusp? Do you need two?! I’m not sure if you were being faceitious w/ this question, Mer, but I’ll tell you anyway. If you were born on a cusp date, then you need to find out the exact minute you were born. If you were born 12:58a.m. and the signs moved from Leo to Virgo at 12:56a.m., then you’re a Virgo. Doesn’t matter if its the same day. Most astrologers go by cusp days; I don’t. Astrolabe.com is a website where you can plug your day/year/place of birth and it will calculate your sun, moon, ascendent, and your planets, at no charge. (but if you want more details, it’ll cost you). V.G. site for anyone who’s curious about that stuff. I just got the Virgo (made an account because of it, hehe) and had to post. i love it. It’s clean & creamy, subtle but not TOO faint. I smell it on myself without it making me nauseous (I am REALLY sensitive to perfumes). Hands down one of my favorite perfumes.